Originally built in 1886, Beifang Mosque is situated at No. 124, Renmin Road, Urumqi. With a golden dome and 2 3-layered towers, the mosque features a strong Islam style. It was renovated in 1944. The Beifang Mosque is located near the Bazaar. The main hall at Beifang Mosque is a civil structure. Walls at the main hall are painted with breathtaking patterns and ceiling lamps are exquisite and stunning. The main hall for worship is not open to the public. You could only appreciate the mosque from the outside as the guards at the gate don’t allow tourists into the mosque. The mosque is only open to Muslims. If you are planning to visit the mosque for photography purposes from the outside, the best time to visit is during the sunset. A few buses pass by the mosque. Therefore, there are a few options. Take Bus 63, 7, 35 and Bus 68 to the Stop of Daximen (大西门站). Then walk to the mosque. As at 28th December 2018, it is free to visit the mosque. Generally speaking, ladies or non-Muslim are not allowed to visit the mosque. Please do not wear shorts or short skirts at the mosque. Please keep quiet at the mosque. Please wear the sunscreen cream, sunglasses and the like to stop the strong sunlight shining your body directly in the dry weather. Please take enough warm clothes with you even in summer as the temperature difference is big between the daytime and the evening in Urumqi. 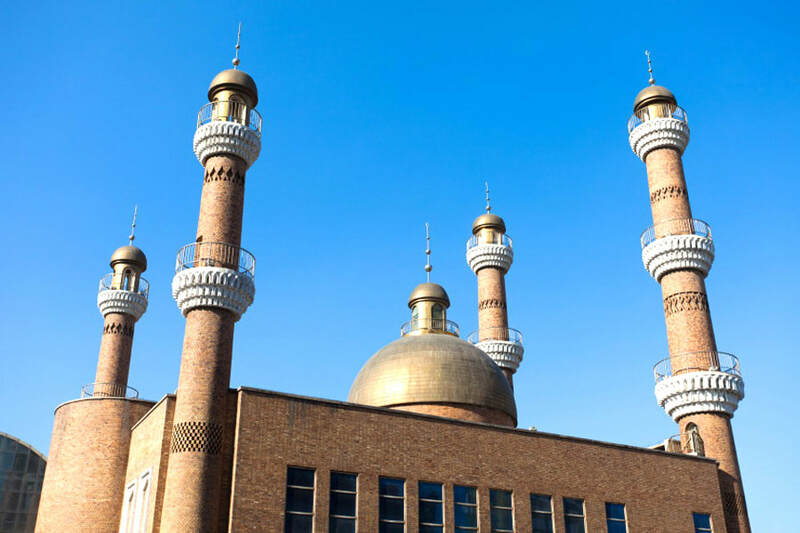 Interested in visiting the Beifang Mosque on a Tour? Wendy Wei Tours offers a variety of different packaged tours as well as custom tours including the Beifang Mosque , among other attractions and destinations. To find out more, please visit our Tours page or Contact Us directly to find out more.